The new Borough Under 13 girls team. Peterborough Rugby Club’s new Under 13 girls team sent out a firm message to the rest of the country yesterday (September 18) when taking part in a big event at Long Eaton. 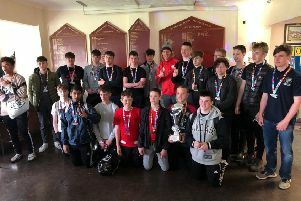 Competing against teams from Yorkshire, Nottinghamshire, Derbyshire, Lincolnshire and Northamptonshire, they won all five games, scoring 33 tries and conceding just one. “We didn’t really know what to expect,” said head coach Simon Potter, “but we were quietly confident. However, to totally dominate the event the way we did was absolutely brilliant and means we’ve firmly put ourselves on the map. The defining moment came in the second game, when Peterborough faced Old Northamptonians, for years by far the strongest girls team in the East Midlands region. Boroigh put in their best performance of the day to win that game by eight tries to nil. It was the team’s first outing in the new Purple Bricks sponsored shirts and McIntyre Electrical sponsored tracksuits and the girls certainly didn’t disappoint.